Sam, Max, and 93NORTHSKIS | alpha technologies Inc. When we added the blog section of our site, we knew we wanted to make it different. Something that people would want to read. Something that would have appeal even to those that weren’t necessarily into the technology aspect of alpha. We wanted diversity in topics, a peek into more than just the working side of the company. That being said, this story has more to do with entrepreneurial spirit which is dear to Bruce and I as that was what drove us to create alpha. One of my favorite sports is skiing. Through that love (some say obsession), I have been lucky enough to spend a lot of time out west, specifically in the Canmore/Banff/Lake Louise areas of our country. 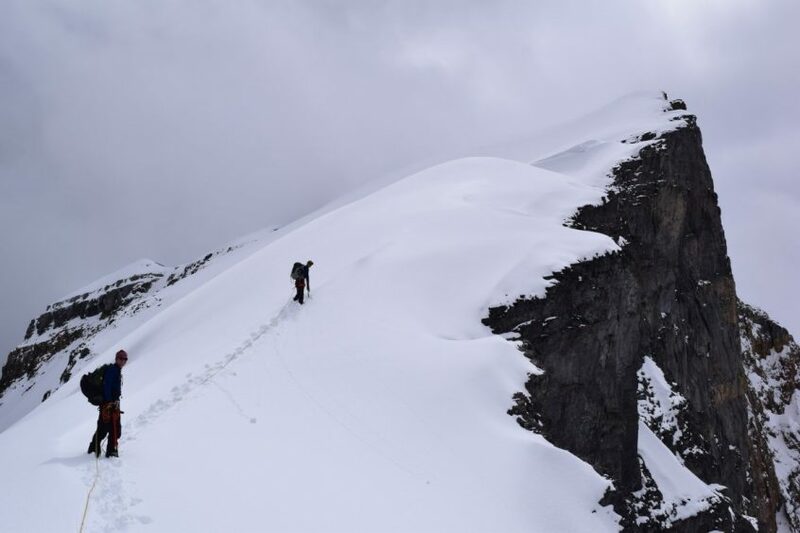 For those that have not indulged, you owe it to yourself as both in summer and winter, you’ll find some of the most beautiful terrain in the world. Having it a few provinces away makes it not only accessible, but affordable. Recently, after a 3 day trip to Lake Louise, my friend Jason sent me a link about a couple of guys that had moved to Canmore to make ski’s. There had been a story on CBC about the guys so before I headed out to the mountains again, I sent them an email asking if it was possible to visit them when I came to Canmore. They were very responsive and open to a visit, so when Shannon and I finished our venue shopping (see future blog post!) we drove over to the industrial area of Canmore and stopped by 93 North Skis. Before I get into the visit, I wanted to talk a bit about the guys behind 93 North. Sam Mcewen and Max Flowerday met at Queens university when they were both taking Mechanical Engineering. Max was from Calgary, and Sam was from Ontario, but both were avid skiers from a young age. Both were working in the oil industry but had dreams of designing skis combining their experience, engineering knowledge, and artistic flair. In October they made their move to Canmore, AB to make that dream a reality. We drove over to the industrial area of Canmore and opened the door to 93North. We were greeted by both Sam and Max as we entered and they were gracious enough to give us a tour of their workshop. We learned how they source the wood for the base locally, using Poplar and Maple mixed to form the core of the ski. Add in fiberglass, carbon fiber, steel edging and a base compound, and a lot of work, pressure, epoxy, and a beautiful top sheet with custom artwork by Emily Beaudoin, an artist from Calgary. 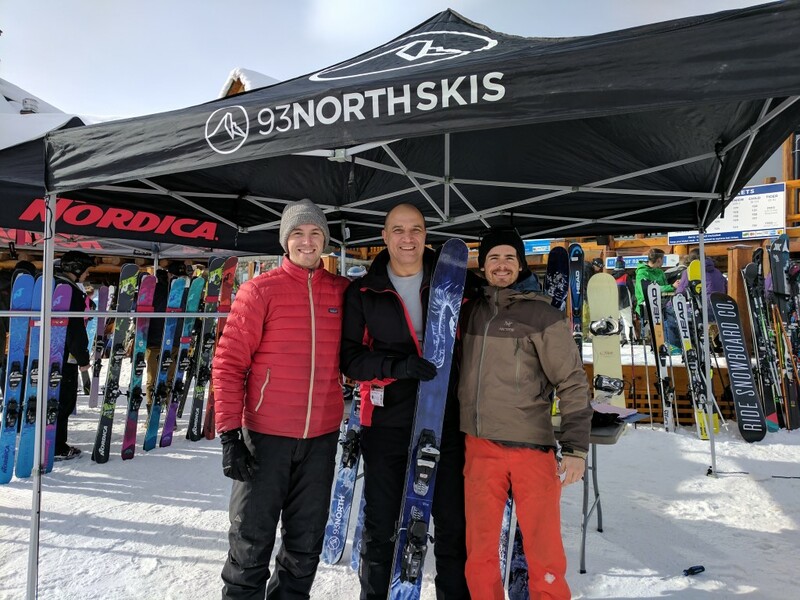 By coincidence, 93North was going to be at Lake Louise that Saturday for a demo event that had them bringing a few sets for people to try out. I think I was first up that morning to take their skis for a spin, opting for a 175 mm length with a 104 waist. I normally ski a 174 length with a 98 waist (the part under your ski boot). These were very close to what I was used to, but built differently and with a different feel. The first thing I had to get used to was that they turned a bit different than my skis. They felt stiffer which would give me a better grab on snow, and after a few runs I decided to head into some moguls and then into the back bowls to seek powder. One thing that I immediately noticed was that I had a better glide. 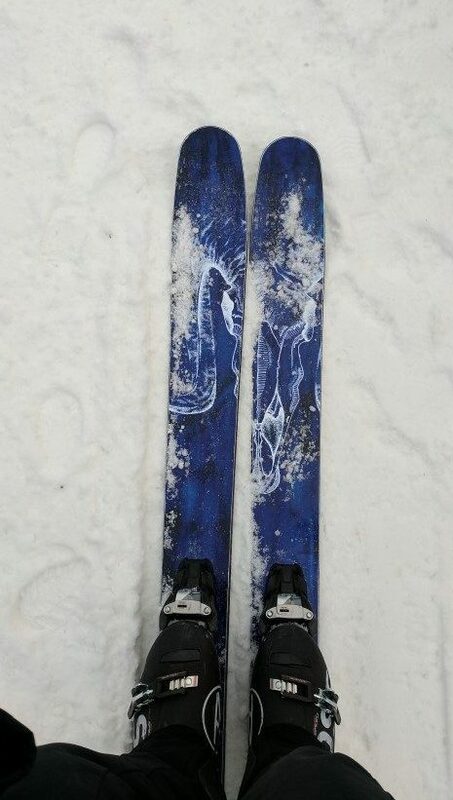 These skis carried speed better and I found I was more comfortable at higher speeds on groomed snow. Whether that was due to design or materials I can’t tell you. I was there to test the new ski against what I was used to. It didn’t take me long to get familiar with the difference. Not as tight turning as my regular skis, but with a more locked in feel. I did find some untouched areas in the back so got a chance to feel how they would ride on powder and as expected, they performed like champs. I am not at a level that can truly put these skis through their paces. They will have subtleties that I won’t notice but I am sure that those better than me would. In moguls they were flexible and when I got caught going over instead of between, they were forgiving and very light so I could make quick turns to adjust when I made a mistake. It wouldn’t have been fair for me to hijack the Andromeda’s for the whole day as there were people waiting to try them out after me, so with much chagrin, I skied back to the base to return them. It gave me a chance to ask a few more questions, like what would be coming in the future. Well there is talk of a narrower version, as well as some design and color changes. You can tell that Sam and Max are always talking skis. They truly are dedicated to building the perfect platform for riding the mountains that they spend their time on. 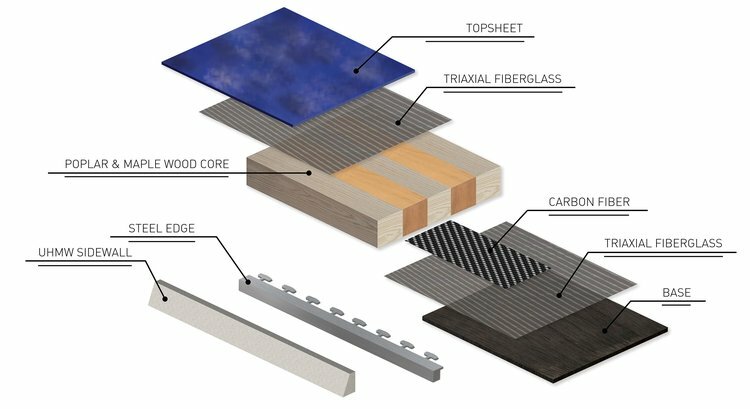 Local materials, local concepts, local terrain. These aren’t guys looking to design something for everyone. They are very specific in how they do things, and you can see the perfectionist lying beneath the surface. As proof of the passion, the next day, I caught Sam with two others carrying 3 sets of Andromeda’s to the lift. This after a day of talking skis all day to strangers the day before. This is more than a job to these guys. That is the only way to truly pursue your passion. I think we will be seeing a lot more of these guys in the future and I will be watching www.93northskis.com to see what they come up with next. What makes an alpha technologies employee? Glass work second to none….